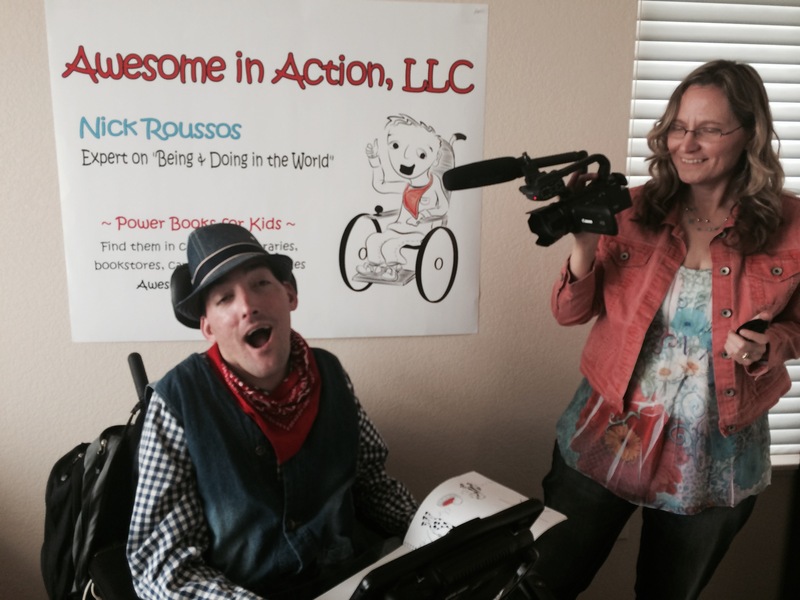 Awesome Advocates help motivate and inspire Nick and his team. His success is a result of their engagement and enthusiasm. Awesome in Action thanks all of these advocates for their generosity and good work. 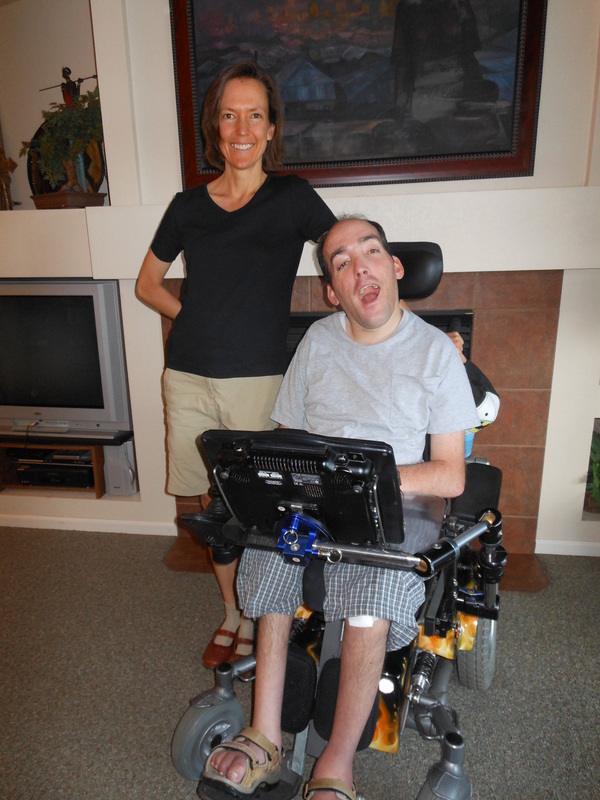 Michele Craig is an Awesome Advocate–not just for Nick, but for all people with physical and intellectual disabilities throughout Colorado. As the HCBS-DD and SLS Waiver and Supported Coordinator with the Colorado Department of Human Services Developmental Disabilities Program, Michele travels across Colorado communicating with individuals receiving services, as well as their care coordinators. She is responsible for connecting all of these individuals and their ideas in order to help employment opportunities run smoothly for everyone involved. Michele is very dedicated to everyone she serves and is always searching for new opportunities for her clients so that they are reaching their full potential in employment opportunities. She is a compassionate and committed woman, making several trips to Loveland to meet with Nick regarding his services, and going above and beyond to create opportunities for him to present and become known in the local community. Nick describes Michele as a kind, helpful, classy, and intelligent individual. She has a fabulous attitude and is forever positive and encouraging. Aside from her position, Michele has served in the community for more than 19 years, as a Special Olympics volunteer and an advocate for all individuals who are lucky enough to be a part of her life. We are all proud and honored to name Michele Craig as our Awesome Advocate! Long ago and far away in the exotic land of Ethiopia, Candi met the Roussos family against the backdrop of the African continent. They became instant friends and Candi has been like family since. Candi has offered her skills and abilities to assist Nick in pursuit of his mission. She has set up the AiA office team with Quickbooks skills so they can enter the digital self-management era. Candi continues to graciously offer her bookkeeping skills to AiA and Nick’s Hope since their inception. Candi, you are an awesome woman, and we are so very honored to have you on the team and named the next Awesome Advocate! Karen has graciously donated her time to create a professional, heart-warming promotional video, all the while balancing life with three active daughters and running her business, Starstream, LLC. We are so grateful to have worked with Karen. She is fun, patient, and obviously very compassionate about her work as a cinematographer. Not only did she have Nick smiling and at ease on camera, but she also spent real quality time with Nick, getting a tour of his home, and interviewing him in order to get a full picture of what Nick and his mission are all about. Thank you Karen for your time, your inspiration and your support! Dr. Jensen is truly an Awesome Advocate. Without even meeting Nick, this kind man invited him to speak to over 100 cub scouts in his troop! 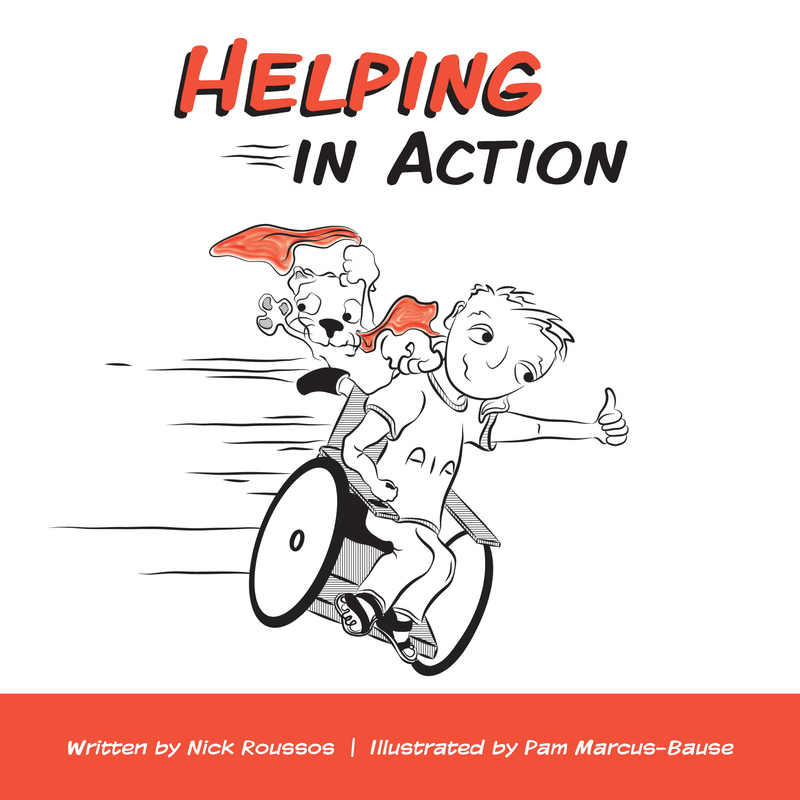 In addition, he has written both a blog post and a review on Amazon.com read here for Nick and his book, Helping in Action. What a way to make Nick smile! Dr. Jensen does not stop at just making Nick smile, however. His blog, Good Day Journal. offers readers positive messages, free downloads of music and books, and inspiring articles and advice. He also has written several books empowering people to use strategies that will help them overcome many of life’s obstacles. Dr. Jenson, a Fort Collins based Psychiatrist and owner of his own practice, treats patients with varying psychological diagnoses; including depression, bi-polar, and anxiety. He specializes in using a Holistic approach; treating the whole body, mind, and spirit, rather than treating an ailment as an independent factor in a patient’s life. We are so pleased to have met Dr. Jenson, and are excited to present to his cub scout troop this summer! Thank you, Dr. Jenson, for being such an Awesome Advocate!! Amanda Keare, M.A., CCC-SLP, has been Nick’s speech pathologist for more than two years at the Speech and Language Stimulation Center in Fort Collins, Colo. Amanda is also an instructor for Wee Hands, the world’s leading children’s sign language and language development program for babies, toddlers and preschool children. Amanda is a fantastic Speech Language Pathologist! She is funny; Nick loves conversing with her about real life circumstances and the humor that comes along with them. 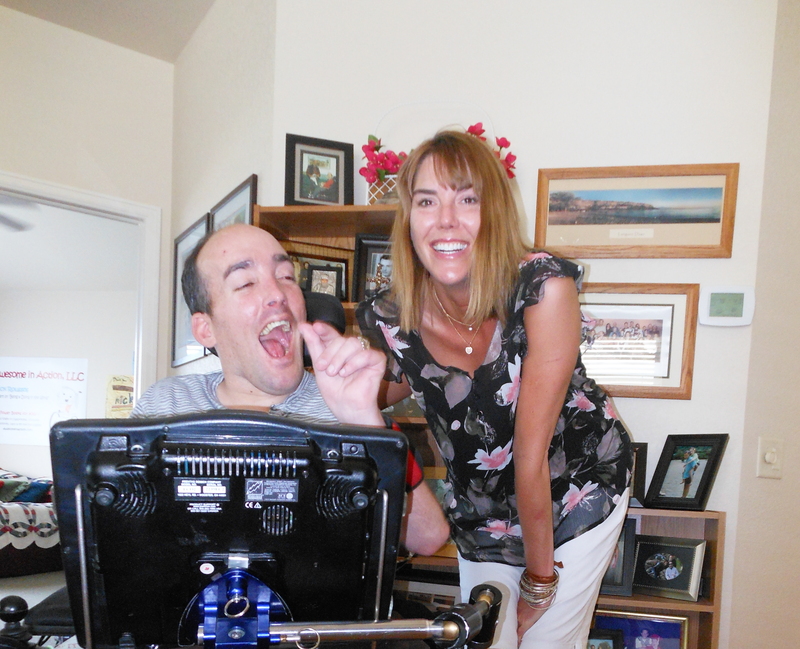 Amanda is insightful and kind, and ensures Nick has the skills and words to advocate for himself with his speech device. She motivates Nick to always try his best, and recognizes the potential he has. Amanda, it is a pleasure to recognize you as our next Awesome Advocate! Seth Kelley is an awesome man with a very large heart. Not only has he jumped through many hoops just to host Nick’s book signing at his coffee shop, but he gives back to the community in every part of his existence. 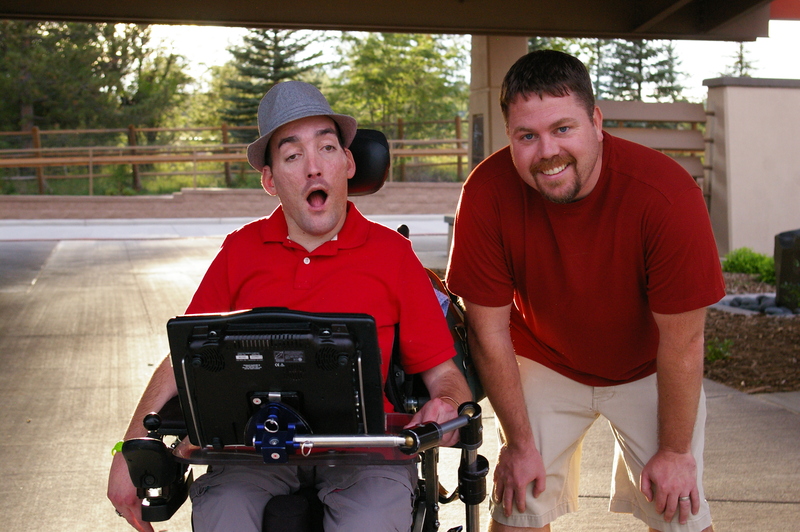 In addition to the coffee business, Seth Kelley has created a website called Waiver Market to assist people with disabilities as they search for services that will fit their needs. This website is a free tool for individuals, care providers, and family members to search, as well as agencies to list on. It is a positive way in which providers, case managers, and the people they serve can connect. Specifically, Waivermarket provides visibility and the opportunity for you to share your story, your mission, and your expertise directly with people that need your service. There is no cost to list with Waivermarket, and their audience is rapidly growing. Please take 5 minutes and explore the Waivermarket website and sign up your agency. Waiver Market is just getting off of the ground, but with your promotion, this website will continue to grow and thrive as an effective way to assist individuals with special needs across the United States. Seth Kelley, we are proud to recognize you as the next, Awesome Advocate! For over 15 years, this charismatic individual has been a part of Nick’s recreational endeavors. Renee Lee is the Certified Therapeutic Recreation Specialist at Adaptive Recreation Opportunities in Fort Collins, a multi-faceted role that she fulfills with ease. Whether it be snow skiing, canoeing, or white water rafting, Renee works behind the scenes to ensure everything runs smoothly and all who are participating have a great time. She has been a bus driver and staff trainer, as well as a friend and advocate for many people who participate in A.R.O. When all is well, Renee never hesitates to jump in and take part in an adventure. Over the years, she has shared many wild times with Nick; camping, white water rafting, and canoeing. 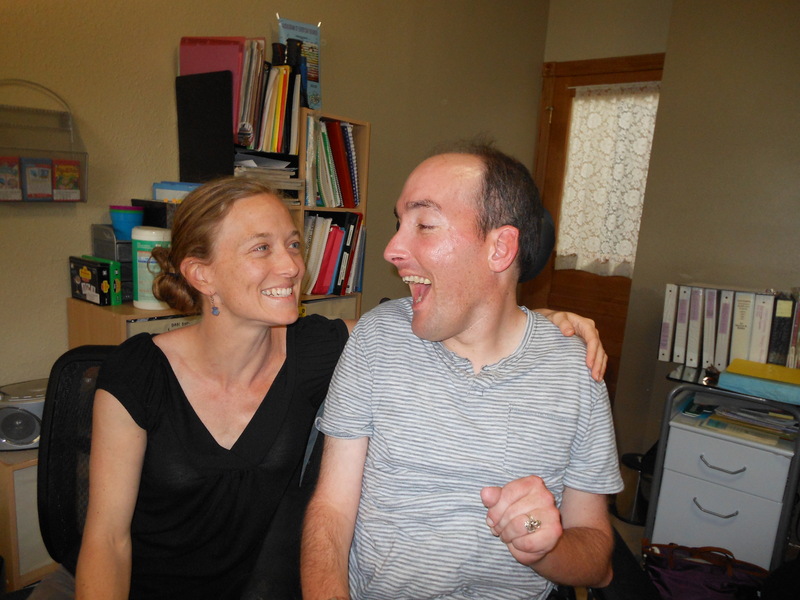 Nick describes Renee as exciting, happy, and brave. She has a big heart, and a sharp mind. Renee has included Nick in a very special A.R.O event in February; inviting him to speak at the 20th Anniversary celebration at the Senior Center. Nick is honored to be chosen to be included in such a special event. Thank you for all you do, Renee. We are happy to recognize you as an Awesome Advocate and friend. 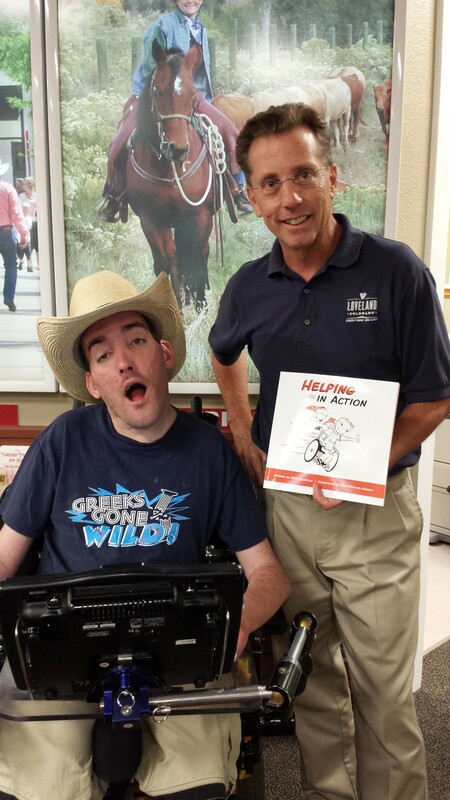 Gary, manager of the Loveland Visitor Center, was the first person to agree to display Nick’s book, Helping in Action, for sale in a retail store. He has shared his wealth of information in order to help Awesome in Action become a successful business. Gary enjoys quality art, and he had an instant connection with Nick as he showed off his most recently acquired paintings and statues. 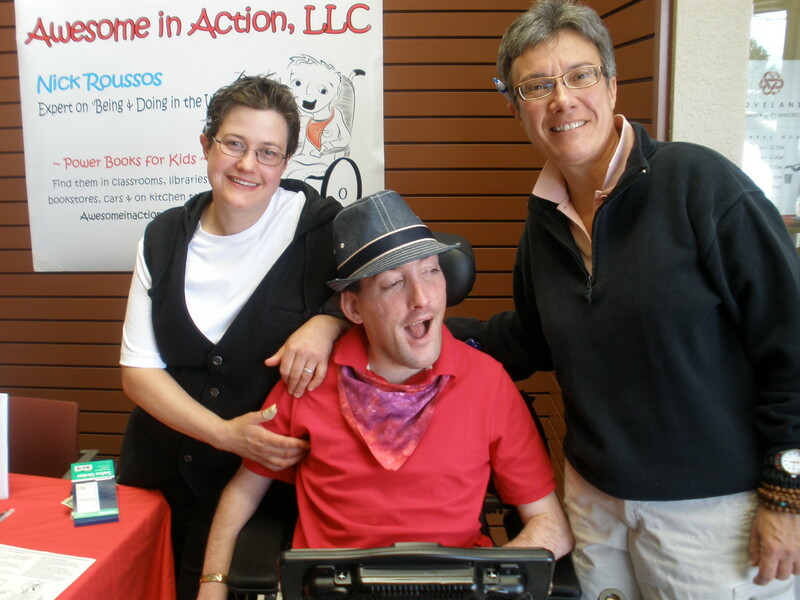 Gary is kind and knowledgeable; we are happy to recognize him as an Awesome Advocate! Thank you, Gary, for hearing Nick’s story and for your support. On my last day with Jeannie Perkins as my job coach, she took me shopping for my first time at the Damn Store up Thompson River Canyon. We had so much fun shopping, and then we found “the zebra coat.” We tried it on, and joked about it being great. Those memories are what I hold dear when I think of my awesome friend and advocate, Jeannie. Funny and creative, Jeannie tirelessly worked to get my business, Awesome in Action, off the ground. Without Jeannie, we would not have had a successful business launch, as it was her energy and devotion that helped me to find my niche as an author and speaker. Jeannie Perkins left Loveland, Co in November 2013, but she really never left my side. She continues to advocate for Awesome in Action from California and Texas. She calls me monthly with new leads, and never fails to mention my book to anyone who seems interested. Jeannie and I chatted over Skype a month after my birthday when she was visiting her grandkids, Grace and Zachary. They sang me a silly song that Jeannie had made up that included dance moves. She always has, and will continue to make me smile. Jeannie is a talented seamstress, and is launching her own business making beautiful coats for children. Check her out on her photos on her Facebook page. Thank you Jeannie, my friend, for always staying by my side! I owe so much of my success to this Awesome Advocate! Amy Randell is a very generous and kind member of the Awesome in Action team. She is always positive, and has fantastic ideas to improve all aspects of Awesome in Action. She is very easy to work with, and has been supportive every step of the way as the business continues to grow and develop. Thank you, Amy for the many hours you have volunteered as our Web Master, and for sharing your in depth knowledge about how to run a business. You are an important member of the Awesome in Action team, and contributor on all levels. We are happy to name you our newest Awesome Advocate. We met Sue through a phone call to the Glenwood Springs branch of the Garfield County Libraries. Within minutes of talking to us on the phone, Sue had looked up Nick’s book, and agreed to meet with us after the half marathon Mountain to Valley Race with Athletes in Tandem. An avid biker and runner, Sue was actually going to be at the race herself…pushing a runner for Athletes in Tandem! Sue hunted Nick down after the race, and after checking out Nick’s book, Helping in Action, she took some photos with us. 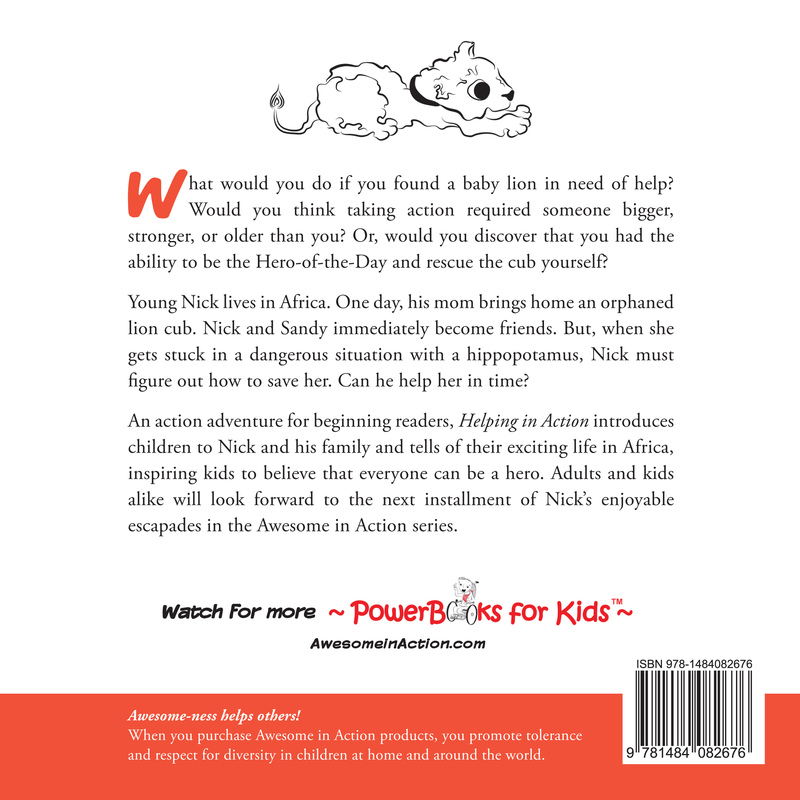 Sue has volunteered to help promote Nick’s book throughout the Garfield Branch libraries! In addition to helping out Awesome in Action, she gave us some great ideas of things to do while visiting Glenwood Springs. With her suggestion, we took the tram up to Glenwood Caverns Adventure Park to watch a free outdoor concert! We really enjoyed our time with Sue, and hope to see her perform at the Superheros Songfest at the Main Ft. Collins library on June 22, 2015! Sue Schnitzer is a true Awesome Advocate, and we are so excited to have gotten a chance to meet her! Robin is the executive director at the Loveland Center for Business Development (LCBD) and has guided Nick and team at Awesome in Action with one-on-one counseling sessions. The LCBD provides small business counseling to Loveland start ups. Robin is a wealth of information and endless supply of contacts for networking. She makes us laugh, and we continued to be amazed by her energy. She is our friend and our cheerleader! Thank you, Robin, for mentoring us on the business and marketing aspects of writing a book. You keep us motivated and on the right track. You are truly one of our most Awesome Advocates! This week, Nick and Sue worked with my students using Dr. James Erekson’s Vowel Phonics approach. As Dr. Erekson says, “Too many sounds, not enough letters!” Vowel spelling is the predominant area that challenges students in writing and reading; we have learned that when we spend time “singing” the vowel sounds in each word, we can better identify them. Nick must have thought we were singing karaoke because he began to sing them with us! The high frequency words on our “word wall” are organized by the ostensibly 17 different vowel sounds in our language. Each vowel sound is represented by a picture that most people should be able to identify, such as “snake” for long a. Sue and Nick have set up Percy, Nick’s computer, so the students can input the letters of each word and see a visual display of their spelling. With Sue’s support, Nick then responds using Percy to say if the child is correct or if the student should try again. Nick was engaged on this task as the students worked with him on their personal spelling words. Sue commented how challenging it is to shift our understanding from memorizing spelling words to one that requires we listen to and identify the vowel sounds first. Thank you Nick and Sue for making this a most interesting experience! Thank you, Cathy, for having me work with your kids! 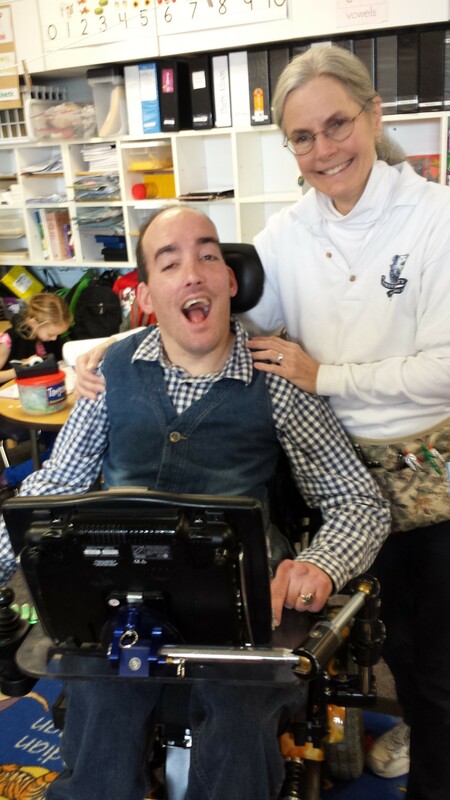 Sue, Audrey, and I always love to visit your classroom!